Let’s go shopping for overland supplies | Where to next? Our latest overland journey kicked off with a shopping spree to stock up on dry goods to hold us for those days when we can’t really buy anything fresh. The only other time we’ve done a big shop before starting a trip was before we headed into Africa for almost year. I’ll write about that soon, but India is top of mind at the moment. Anand and Deepti have a clever idea for getting passengers involved in a shop. 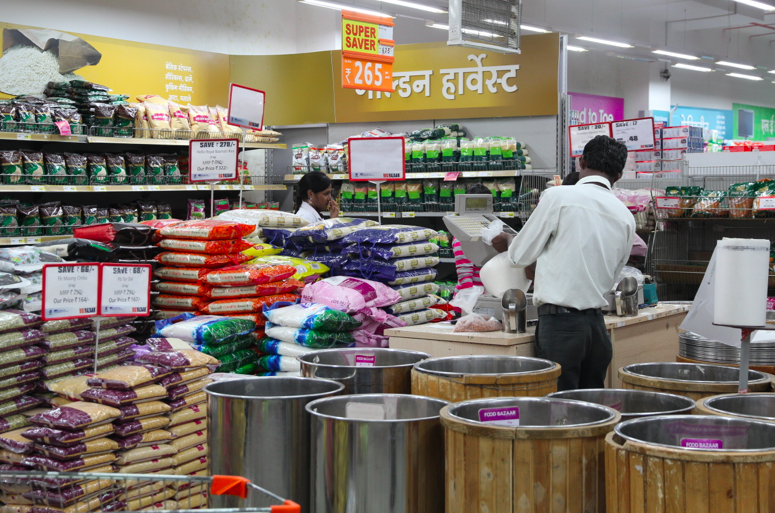 On day one of our overland, they took Renae, Gary, Poor John and me to a Big Bazaar supermarket in a medium-size shopping mall in Jabalpur. Once we arrived, they handed each of us a list of four or five items to find in the store. I drove the trolley and we scattered around the store to buy essentials such as cooking oil, spices, rice, dry noodles, sugar, salt, pepper, jam, peanut butter, milk powder, cereal, dish soap, sponges, tissues and the like. We even bought a packet of table napkins endorsed by the famous and talented Indian cricketer, Sachin Tendulkar. I’m a good shopper, but almost missed out on the top bargain of the day. When I grabbed a five-kilo bag of rice, the salesperson put a second bag in the trolley. I took it out and said, thank you but I only need one. He looked puzzled. 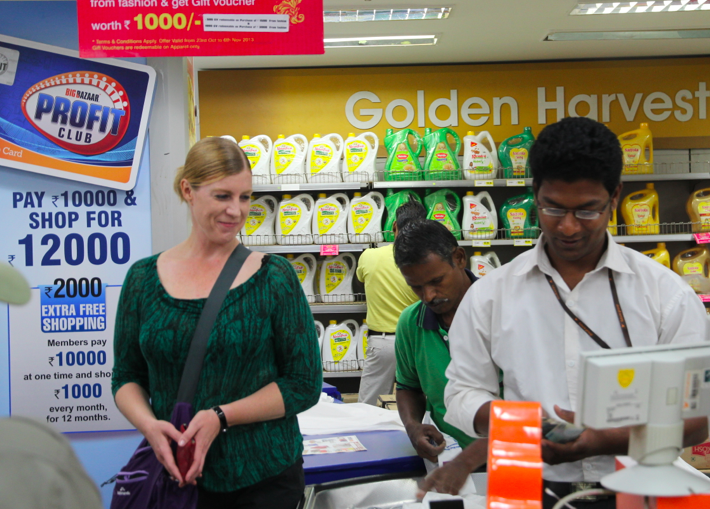 When we got to the checkout, Anand asked who bought the rice. Me, I piped up. Well, go get the other one, he said, it’s buy one, get one free. Oops! So now we have 10 kilos of rice for a month. I wonder if we’ll need to buy more? Interestingly, lots of groceries items were discounted for Diwali, the Festival of Light, which is the year’s most important holiday for Hindus. 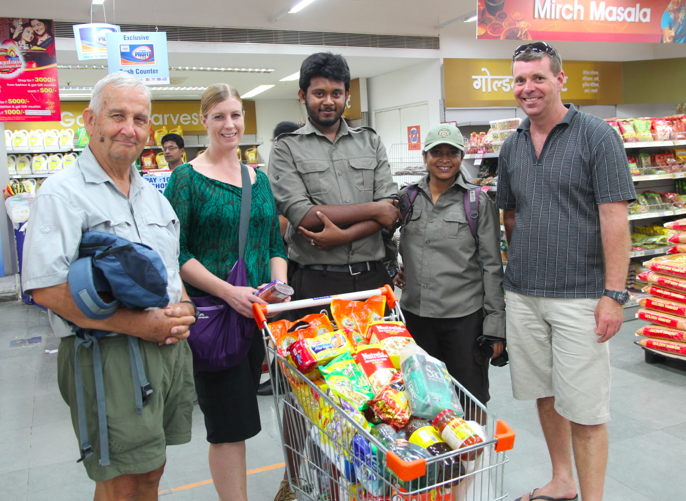 Our final bill for an initial trolley of groceries was 4100 rupees or about A$73. Checkout was an interesting and slow process. 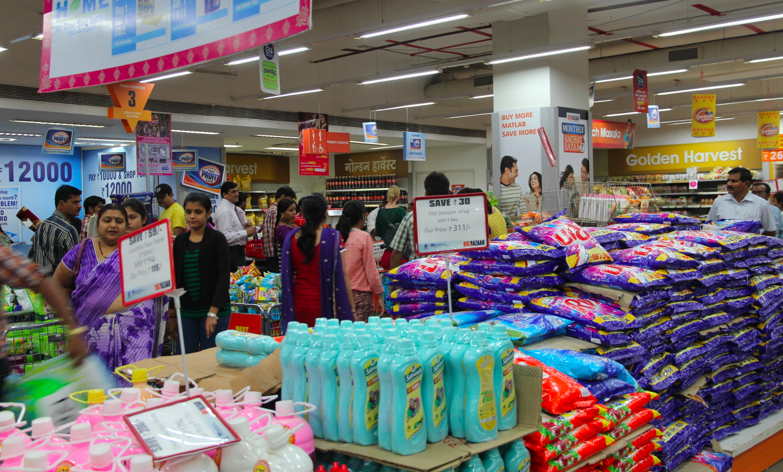 Many customers were taking advantage of the Big Bazaar’s Profit Club, a special that meant they could pay 10,000 rupees and then spend 1000 rupees per month for the next year at that supermarket. Nice incentive, but supported by mounds of paperwork. Shoplifting must be a problem in Indian supermarkets. Renae bought a bottle of moisturiser and popped it in her bag after paying. Oh no, that won’t do. The bottle had to be put in a small carry bag, which was then sealed with a cable tie. A number 1 was written and circled on the bottom of her docket. Later we realised this was to let the fellow at the exit check how many bags she was supposed to have. Then it was on to the general markets to get Diwali decorations, lights, clothing and fireworks. Just because we would be camping didn’t mean we wouldn’t be celebrating. Buying clothes was the biggest challenge. I finally found something that went around my bust. It fit, but it didn’t flatter, and I’m rather hoping that a pic of me in it never makes it into cyberspace. That price tag is somewhat close to what you pay for a trolley load at Aldi! Also are you sure the new clothes just wouldn’t fit over your new bra from M&S? G’day and well done on the rice Peggy, true! We got two bottles of dish soap for the price of one and plenty of other things were discounted, so it was a very successful shopping expedition. Hi Peggy, I’m enjoying the Indian travel tales. I leave for South America next week! Thought I was all set and have hit a snag. Bought my USD for a ‘reputable’ UK travel company and it’s all arrived in used bills, usable but not great condition, and mostly dated pre 2006. Our guidance is not to take notes pre 06, but the travel company will not exchange them as their view is they are perfectly usable. Did you or your group have any issues using older USD notes? Would appreciate any advice! Personally I’d go rip the arms off the people at the reputable travel agency. What a disservice they have done for you. Naughty, naughty, naughty. I see that Sy has given some advice, which I will check before I reply further. Got my first connection for several days. No need to be in tears. It will all work out okay. But tell us who the travel agency is so we know never to use them. And do try the banks, as they may be quite helpful and then we can report who the good guys are. Hi Peggy, I used Thomas Cook. On Sunday they agreed if I sent the whole order back to them they will refund it in full. I’ve sent it back and fingers crossed they do process the full refund. Then had a second nightmare with another company (this one entirely my fault/stupidity). Fortunately Oasis have been really helpful so although the whole fiasco has cost me some money, I think I’m about good to go. I’m just going to have to use ATMs as I go I think. I leave in 4 hours! Will be tweeting as I go! Good to know Thomas Cook came to the party. Hope all that refund came through. And I knew Oasis would be helpful. I think you’ll find the ATMs work well. But try not to pay for things with a credit card, say, in a restaurant or anywhere they take the card away and can copy the details without you seeing. Otherwise, I think you’ll be fine. So excited for you. Are you on Facebook too? I would make a few phone call(s) to a local US bank(s) and inquiry about them exchanging your older USD notes and for newer looking ones. You never know, they might say yes and might be less of a hassle when in South America (with local people reluctant to take the older notes?). Andrea. If you start your travels in Ecuador, you might be able to change all the money there. Ecuador’s economy runs on US dollars and I think they take all kinds of bills there. The ATMs dispense US dollars too. And feel free to ask Natalie at Oasis for advice. The current tour leader might know too. They are there to help. The ‘problem’ with older notes is that they don’t have the anti forgery elements ‘coded’ in to them so foreign countries are more suspicious of the money, thinking it might be counterfeit. As long as the bill shave no tears and no writing on them, you might be okay. But again, I think Ecuador may be your salvation because they use all dollars. Also Sy’s advice about checking with a local bank that has US ‘parents’ is a very good idea. The last time we withdrew money in the US, half the bills were older than 2006 but by going to several different banks, we were able to exchange. It’s worth a try even in the UK. P.S> I haven’t written about cameras yet, but briefly I suggest a point-and-shoot option if you are not a mad-keen photographer. I am a photo nut and use a 600D Canon. I carry two lenses—a wide angle and a telephoto. My camera bags weighs 3 kilos, and it’s not the best solution for everyone. Thanks Peggy, I’ve gone for my trusty point and shoot. My packed rucksack weighs 18kg with another 5kg in a day bag and it’s a struggle to carry, but really struggling to see what I can take out at this point! A fair portion is stuff that’ll just get used up on the way though – who knew a 6 months supply of daily disposable contact lens could weigh so much? If you can carry your rucksack and supplies will be depleted as you go, you’ll be fine. Don’t worry. And if you end up with excess stuff at the end of the trip, you can always add it to the ‘charity bag’ that goes to orphanages.